Contoured back and tractor style seat to help eliminate fatigue. Multi-Function - Three levers to modify angle of back relative to the seat, control tilt and forward tilt for keyboard intensive activities. Tilt is free float or locking within a fixed range. 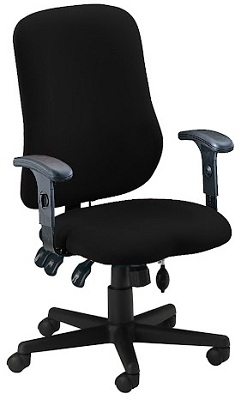 T-shaped arms are height adjustable and have comfortable impact resistant urethane arm rests. The Seat Height is 17 1/2" at its lowest and 21 1/2" at it s highest.